Ethanol precipitation is a commonly used technique for concentrating and de-salting nucleic acids (DNA or RNA) preparations in aqueous solution. The basic procedure is that salt and ethanol are added to the aqueous solution, which forces the precipitation of nucleic acids out of solution. After precipitation the nucleic acids can then be separated from the rest of the solution by centrifugation. The pellet is washed in cold 70% ethanol then after a further centrifugation step the ethanol is removed, and the nucleic acid pellet is allowed to dry before being resuspended in clean aqueous buffer. So how does this work? First we need to know why nucleic acids are soluble in water. 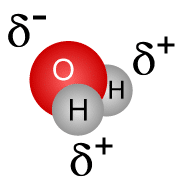 Water is a polar molecule – it has a partial negative charge near the oxygen atom due the unshared pairs of electrons, and partial positive charges near the hydrogen atoms (see the diagram on the right). Because of these charges, polar molecules, like DNA or RNA, can interact electrostatically with the water molecules, allowing them to easily dissolve in water. Polar molecules can therefore be described as hydrophilic and non-polar molecules, which can’t easily interact with water molecules, are hydrophobic. Nucleic acids are hydrophilic due to the negatively charged phosphate (PO3-) groups along the sugar phosphate backbone. Ok, so back to the protocol. The role of the salt in the protocol is to neutralize the charges on the sugar phosphate backbone. A commonly used salt is sodium acetate. In solution, sodium acetate breaks up into Na+ and [CH3COO]-. The positively charged sodium ions neutralize the negative charge on the PO3- groups on the nucleic acids, making the molecule far less hydrophilic, and therefore much less soluble in water. The electrostatic attraction between the Na+ ions in solution and the PO3- ions are dictated by Coulomb’s Law, which is affected by the dielectric constant of the solution. Water has a high dielectric constant, which makes it fairly difficult for the Na+ and PO3- to come together. Ethanol on the other hand has a much lower dielectric constant, making it much easier for Na+ to interact with the PO3-, shield it’s charge and make the nucleic acid less hydrophilic, causing it to drop out of solution. Incubation of the nucleic acid/salt/ethanol mixture at low temperatures (e.g. -20 or -80C) is commonly cited in protocols as necessary in protocols. However, according to Maniatis et al (Molecular Cloning, A Laboratory Manual 2nd Edition… 2nd edition?? – I need to get a newer version! ), this is not required, as nucleic acids at concentrations as low as 20ng/mL will precipitate at 0-4C so incubation for 15-30 minutes on ice is sufficient. This step is to wash any residual salt away from the pelleted DNA. Use Sodium chloride (0,2M final conc) for DNA samples containing SDS since NaCl keeps SDS soluble in 70% ethanol so it won’t precipitate with the DNA. Use Lithium Chloride (0.8M final conc) for RNA. This is because 2.5-3 volumes of ethanol should be used for RNA precipitation and LiCl is more soluble in ethanol than NaAc so will not precipitate, but beware – chloride ions will inhibit protein synthesis and DNA polymerase so LiCl is no good for RNA preps for in vitro translation or reverse transcription. In these cases, use NaAc. Use Ammonium acetate (2M final conc) for the removal of dNTPs, but do not use for preparation of DNA for T4 polynucleotide kinase reactions as ammonium ions inhibit the enzyme. Increase the time of incubation ice before centrifugation to 1 hour. DeoxyriboNucleic Acid… in other words, DNA has the sugar deoxyribose, and obviously, it’s a nucleic acid. Thank you very much for your great article. How can we cite your article? I could not find the date published? I had mistakenly added sodium acetate at pH 7.0. How can I troubleshoot? I want to get rid of TE buffer in a soil DNA extract and thought of precipitating DNA with ethanol. Does anyone know how much of the original DNA can be recovered/will be lost? How can we remove the ethanol from the eluted DNA in case if it still remains in it ? I think leaving the eluted DNA in RT for 15-20 minutes will remove the remaining EtOH. If you want to be absolutely certain you can even speedvac it dry (or just leave it on a heat block, depending on your volume). You’ll be left with a pellet of DNA and the dried salts from the buffer to be resuspended in water. Is there somewhere a reference why 0.01M MgCl2 is supporting RNA <100bp for precipitation? Thanks to all authors, I’ve got a useful information about EtOH precipitation. But I still have one question about “Choice of salt”. 1.How can each type of salt differ the yield? 2.What is the different between NaOAc and ammonium acetate’s action on DNA? 3.How can ammonium acetate remove dNTPs ? Can’t NaOAc remove them? and why? For the salt solutions there are different pH recomendations. Could you explain which pH is ideal for RNA and which for DNA and why that is? Nice article and also helpful comments. I’m still a bit confused about one point: if salt is so important for neutralizing the negative charge on the RNA/DNA so that a pellet forms during the first centrifugation, then why does a pellet still form during the 2nd spin with 70% EtOH after the salt has been washed away? Hey Nick..Hats off for u man…. This is quite basic things…..i dont know.from where do u get these knowledge bro..? I have a question maybe you can answer. Why is isopropanol more effective at precipitating nucleic acids than ethanol? Hi Nick, thanks for your useful article. Do you think an additional amounts of ethanol causing a problem during precipitation? my sample volume is 50ml so according to the protocol I used 0.1X sodium acetate but unintentionally I added 250 ml ethanol 100% instead of 125 ml.What is your idea? i used Macherey Nagel Plasmid miniprep kit and eluted DNA into the elution buffer (kit component) containing 5mM Tris-Cl (pH 8). Can i re-precipitate the DNA because i want to dissolve it into Water? While I was trying to precipitate my DNA, I accidentally added 3M NaOAc instead of 0.3M. Is there any way I could counter balance that, maybe with addition of more 95% ethanol, so that I can precipitate my DNA?? Hi Nick and everybody! Thank you so much for your nice and informative articles and comments! In my last RNA isolation experiment for qRT-PCR, I made a mistake in taking denatured ethanol (containing 1% methyl ethylketone) instead of pure ethanol. Has it damaged the whole thing? I am very anxious about that. I have a similar problem like Marie (posted 19th April 2010): overkilling of RNA with isopropanol…. AND a very PRECIOUS RNA sample, which I have to save: The problem arose during my RNA precipitation. (RNA after usual Trizol protocol was not very clean (260/230 <1.1)). So I added 1Vol Chloroform, vortexed, did a centrifuge to separate the phases, took the aqueous phase and added – 5 Volumes!! of Isopropanol (100ul aqueous phase + 500ul isopropanol). After the centrifugation I see now in my 1.5ml tube a floating pellet, not sticking to the wall. Could you (or anyone else in the blog) please give me a suggestion how to save my RNA sample? I am having problem with glycogen treatment. I extract DNA from dried blood on filter paper using Qiamp blood mini kit. After extraction of DNA, I add glycogen dissolved in 3M Na-acetate and 4 volume 100% ethanol. then I store the mixture at -80C for 3-4 days, then centrifuge at 14000rpm for 10 min followed by another 10 min centrifuge after adding 70% ethanol. then air drying in bio-safety cabinet. finally re-suspending in water. so, anyone can see any problem? please ask me. I stored glycogen at -20C. Is it has any affect on performance of glycogen? So, what additional reagent sodium-EDTA or MgCl2 which will give batter yield? Can DNA alone be precipitated with etoh/na acetate method after restriction digestion. I have heat inactivated my enzyme and want to get rid of that without using any column. And we don’t have Ph/chloroform set up too in our lab currently…grrr…what should I do to have only my DNA ready for electroporation? Please suggest. Hi Nick! Thanks for the site, here I’ve found precious information. I have a question: if I use a Stain Straction Buffer (SEB) that contains SDS 20% and NaCl 5M, wich salt is the best for precipitation, Sodium acetate or Sodium chloride? Thnaks a lot! I’m trying to extract alcohol from my RNA samples (RNA + DEPCwater + NaAc) but after I centrifuge it at 10.000rpm for 30min I can’t see any supernatant, it all look the same to me. So I centrifuge it again but this time with the tubes open for 15min and the again, nothing. What am I suppose to be seeing? I got to extract the ethanol because it blocks the reverse transcriptase but all I see after 30min centrifuging looks the same, no supernatant. We are wanting to precipitate DNA (actually eDNA) from a 2 liter water sample. Is there an inexpensive way to do this? I’m attempting a microarray for the first time and I’m at the point where I have just enough decent RNA to pool and concentrate before RT. I’m planning to concentrate by sodium acetate precipitation but I have a few concerns. Mostly I worry about nuclease contamination. Should I go to the trouble to buy a certified solution from someplace like Ambion or just mix up a 3M solution with lab-grade reagents? If so, should it be treated with DEPC as water would be or just use DEPC treated water to dilute, autoclave and hope for the best? My other question concerns co-precipitants. Some sources say you should only bother with them if you have very low concentrations you’re trying to recover – nanogram amounts. Mine is 0.2-0.5 ug/ul. On the other hand, some say they have much better recovery in general and form a nice visible pellet. I’ve heard glycogen is not good for microarray application, so linear acrylamide seems like a decent bet. Trouble is, the pre-made from Ambion is fairly pricey for a few small vials. I understand you can compound your own from acrylamide with a few steps and additional reagents to polymerize it, but is it worth the time and hassle for my application? i just wanted to know if subtractive hybridization and suppression subtractive hybridization topics are being discussed here? thanks! I have a question, what would happen if I added 1V of ethanol instead of 2V? you see, I’m still a student and cannot perform the experiment myself…thanks! 1) I added 3M NaOAc and 100mM EDTA but I forgot to add 100% EtOH in my sample. I realized about that after a 10min centrifugation. Then I quickly add EtOH and pipetted up and down several times, leave at room temp for 5 mins and proceed to 20 mins centrifugation. Is this gonna cause me any effects to my precipitation? 2) Instead of using 100%EtOH for precipitation, is it ok to use 70% EtOH? I have a question about if I don’t add any salt compound before I precipitate DNA with ethanol, how does ethanol work to precipitate DNA? because I work with QIAGEN stool kit, which isn’t added any salt compound in it. only adding proteinase K and AL buffer (contains guanidium chloride) before adding ethanol. Hello Nick, I have a question about: if I don’t add any salt compounds before I precipitate DNA with ethanol, How does the ethanol work to precipitate DNA? because, I use QIAGEN stool kit, and the procedure before adding ethanol, I just add proteinase K and AL Buffer (which contains guanidium chloride). congrats on the site! Its really awsome and it helped me a lot. I just have one problem, when I add ethanol and DNA precipitates it just makes it in small fragments… before I used the same reagents and DNA just clumped together right after adding the ethanol. Anyone can have some suggestion as to what this may be due to? Thnx a lot! This really site really helped a lot! Thanks a lot for the great post and discussions! I would like some advice to purify very small DNA fragments. In my tube I have the 40 bp DNA I want to purify from a mix containing dNTPs, proteins, salts and 10-bases oligonucleotides. and I don’t want to use a gel purification step as I will do this on a large scale. I plan to increase the time of incubation on ice and the time of centrifugation as recommended by Nick. – if I also add MgCl2, can it interfere with further enzyme restriction cut? – is there a better salt to use for small DNA? sodium acetate or ammonium acetate? – are there any other tips to increase the yield or the purity of the sample? This is a really great site. Fell in love with it instantly. Have a question: What effect does the grade of ethanol being used has on the precipitation? For example, reagent grade vs. crude ethanol. I’ve had good DNA recovery usin crude etoh in our lab but would it affect downstream applications like restriction digestion? Can you make up sodium acetate and store at 4C or -20C for long periods?? What kind of desalting or precipitation do you suggest? Hey! Great article, great discussion! Simple Question: i run a genemole RNA-Extraction and i got my totalRNA sample in TRIS (100µl). I need it desalted for RNA-Chip analysis but be especially interested in microRNAs, so i fear any loss! We have added glycogen after the isopropanol (1 vol) (or 2 vol of ETOH), and it will increase your yield. What small amount of DNA you have that will resist precipitation will have to share that soluble compartment with the glycogen. You can add it at 37 C to your samples, mix, and then cool them down again. You also benefit from the post precip wash steps because the larger more intact pellet you get will prevent those thinner DNA residues from fragmenting and becoming physically washed away during the 70% ETOH washing. People think the yield is all about the precipitation step, but I am constantly showing staff and students how I can recover twice the DNA they recover from the same solutions simply by taking much more care of the pellet (or residue) once you get it. I make my staff “soak” (wash) three times, not twice, and not try to take off every uL of wash. The last bit dries away fast in the spin vac. Trying doesn’t hurt. In your case though, I don’t know if it’s the right thing to do. The background idea is that glycogen will start nucleation (i.e. formation of many tiny precipitate particles) and then the DNA will stick there, helping to grow the particle and precipitating along. So if the glycogen isn’t well dispersed, it’ll form few nuclei, and the increase in yield won’t be as much. You’d need to make sure that the glycogen forms very small precipitate particles, say, by vortexing very well – but if you’re extracting gDNA… that’s against your interests, I guess? I have a DNA extraction protocol that tells you to add Glycogen to the isopropanol prior to adding my lysed and protein precipitated supernatant, to enhance gDNA yield for compromised blood samples. What I’d like to know is whether you can add the Glycogen to the isopropanol after having already mixed the the supernatant with the isopropanol, and still get the desired increased yield? The reason for this is that I do not want to go to the expense of adding molecular grade glycogen to every sample, just those where I cannot see any stringy clump of DNA precipitated out from my supernatant by isopropanol. Thank you Sir, I have precipitated DNA many times but I did not know the exact function of ethanol and salt. So thank you again for your deep explanation. I think you’re overkilling with isopropanol. According to the Trizol protocol, you should add 500ul of isopropanol for each 1ml of Trizol used. This is based on the assumption that you’re going to retrieve 450-500ul of RNA-containing supernatant for each 1ml of Trizol. Since you’re saving only 600ul of supernatant (why so few? ), and you split it into two 300-ul aliquots, you should add 300 ul of isopropanol to each tube. Also, you should follow the protocol, there’s usually no need to tweak it at all. I.e. you’re adding 500ul of isopropanol (while 400 ul is the correct amount for 2ml Trizol, which is roughly what you have after the dilution). Finally, it’s really best to make sure that the cells are thoroughly lysed in the first day. If cells lyse incompletely, their RNA can meet its end against an undenatured RNAse before escaping into the Trizol solution. So if you’re going to add more Trizol anyways, it’s just best to add it straight away when you’re lysing the cells. Hi ! I am currently experiencing problems with RNA precipitation. Here is what I do: I perform RNA extractions using TRIzol reagent with cells in suspension. I centrifuge them, discard the supernatant and then add 2 mL of TRIzol (for about 3-5 millions cells) and put the tubes at -80C O/N. The day after, I make new dilutions of TRIzol (about 500 µL of sample + 1.5 mL new trizol) to make sure all the cells are really lysed and I add 500 µL of chloroform for the extraction. After centrifugation 5min 12000g at 4C, I obtain the classical 3-phase separation and I transfer the aqueous phase in 2 new microtubes (300 µL/tube), then I add 900 µL of isopropanol to each tube. My problem is that after the centrifugation, I obtain a transparent gel-like pellet that does not stick on the side or bottom of the tube, but floats in the tube. What is wrong? DNA contamination due to too much chloroform ? New dilution of trizol is unnecessary? too much isopropanol??? should I use ethanol instead? I’ve been running 100 micro liter PCR reactions and getting plenty of 2007 bp product with none of the DNA held up at the origin when 5 microliters of it is run on gel. The problem comes when I go to extact the PCR product and get it dissolved up in water. Every time I try to dissolve my pellet back up into 100 microliters of water and run 5 microliters on a gel there is a significant quantity of my DNA which refuses to enter the gel. It just stays hung up at the origin. Can you help? Below I detail my procedure. I remove all of the PCR volume from under oil, bring it up to a 250 micro liter volume with water and then add 250 micro liters of phenol saturated with 0.5M Tris-HCl (pH 8.0). The upper aqueous phase is clear but after it is transferred to a clean, new microcentifuge tube turns quite cloudy. I add twice the volume of 2% potassium acetate in 95% EtOH to the aqueous phase, vortex, and allow to precipitate overnight at -20 degrees C. I spin for 2 minutes on a desktop centrifuge and decant the salted Ethanol. The pellet is allowed to dry in a vacuum for 10 min (There is usually what appears to be a small droplet of something present in the tube with the pellet after drying). I then add 100 microliters of water and allow the pellet to dissolve for 2 hours on ice with periodic vortexing every 15 minutes. Five 5 microliters is then removed and run on gel. Note: the small droplet alluded to above does not disappear even after 20 minutes of drying under vacuum and as yet I have not been doing any 70% washing of the pelleted DNA. I just want to ask, what effect does the ethanol extraction on the DNA extracted and the subsequent AGE band it forms? What is DNA is dissolved in carbonated water? Say, like Human remains in soda tanks in McDonalds. Would this method work? If the goal is just to show there are traces of Human remains in water, what would be the easiest way to make it evident? Sorry for being an idiot, I figured out the calcs moments after posting, it’s 0.1 volume of a 3M solution of 3M NaOAc, so the 0.3M “final” concentration is referring to the concentration of the salt in solution PRIOR to addition of EtOH. Still curious about the different final salt concentrations though! Quick question – if the purpose of the salt is to neutralize the backbone charge, why is the final concentration of the different salts used so disparate? Also, in trying to check calcs, if one uses 0.1X NaOAc (stock @ 5M)and 2-2X EtOH, I don’t calculate a final concentration of 0.3M…??? Example, resuspend sample in 1 ml, add 0.1 ml 5M NaOAc, add 2 – 2.5 ml EtOH. I get (0.1 ml)(5M) = x (3.1 ml), x = 0.16 (or if using 2.5 ml EtOH, x = 0.14. I have a qouestion. I am doing HRM analysis for SNP genotyping. Salt concentration of DNA samples has high effect in this analysis. the DNA pellets are dilouted in TE. Would you please help me how to precipitate salt from my Samples without extracting DNA again? but what is the role of low tempreture in precipitation? I have extracted genomic DNA from my samples and quantified by using UV absorbance and fluorescence-picogreen to check the sensitivity of the quantitation method. The outcome was, DNA yield quantified by picogreen are almost 3 times higher than the yield in absorbance. The ratios of A260/280 are within the range (1.6-2.2) but the ratios for A260/230 are very very low in range 0.28-0.5. I used salt out method to extract the DNA. Do you think the reason because it is high salt in my DNA or because I didn’t wait to dry the pellet after DNA precipitation with 100% EtOH, followed by 70% EtOH wash step before adding the TE buffer? Therefore, is it possible that I still have ETOH in my DNA which makes the DNA difficult to dissolve completely and only when quantified by picogreen which bind specifically with dsDNA it gives high yield? From what I have read in previous paper, DNA yield by absorbance are higher compared to picogreen. Please help me to understand this situation. moderator-edited post because of spelling errors. I have a question, do the PCR purification kits help in desalting DNA? Im doing something where Im eluting ssDNA with a buffer containing Urea…can i use these kits to get rid of the Urea? Or should i do a std ethanol precipitation? will that help get rid of the Urea? Im trying to avoid dialysis..
Maniatis is one source and if you don’t have that (it’s old) then check the new Sambrook and Russel Molecular Cloning Manuals. The appendix has a section on ethanol precipitation. would you tell me the soucre of your statement, that NaCl should be used when SDS is present in the preparation? i used ethanol precipitation. but at the lots of salt precipitated with DNA. is there any way to clean up the salt because the i have extracted the DNA from gastric biopsies. I am trying to precipitate DNA using the commonly used ETOH method.However, I can see that the salt has precipitated to the bottom forming a lot of white precipitates!Could you tell me if there is anything I can do. I wanted to ask you that why it is so that some DNA samples immediately precipitates out easily as soon as chilled ethyl alcohol is added whereas, the others requires storage for about 15-20 minutes at -20C and also I wanted to know that what is the role of Ethyl alcohol in DNA precipitation. I will be very thankful to you if you help me out in this. It is possible. I recall hearing this from other users when I worked at Qiagen (that after ethanol ppt. it appears). If you give them a call and ask about it, they might be able to confirm that it is indeed just a little resin and to remove it, or if it is something else. If the DNA is performing fine in reactions, it is probably just resin. Thanks for your reply. I do the ethanol precipitation after extracting the DNA from agarose with a Qiagen kit. I always like to do an ethanol precipitation after gel purification to remove any excess salts or left over agarose. I find this helps with downstream ligation. I only see the white precipitate after the ethanol precipitation, not after eluting the DNA off the column. I suppose its possible that the ethanol precipitation knocks the column “leakage” out of solution and it remains insoluble afterwards. Is this plausible? Are you using a silica column method for purification? Or an anion-exchange column (such as qiagen plasmid kits)? Sometimes the resin leaks through into the final samples. If this is not affecting any results, you can spin it out and transfer the DNA to a new tube. Every time I do an ethanol precipitation of DNA, I find white flakey precipitate in my sample after resuspending in either ddH2O or Tris pH 8.5. This happens regardless of how well I try to wash the pellet with 70% room temperature ethanol. Does this happen to anyone else? Is it just left over salt that is no longer soluble for whatever reason? Does it affect downstream steps? It doesn’t appear to affect transfection, but I am wondering about enzymatic reactions where the salt concentrations matter (e.g. ligation). It could be proteins or insoluble salts. I’m using a kit right now that uses a protein precipitation which relies a lot on temperature. We don’t have a refrigerated centrifuge so while I get good protein precipitation while the solution is on ice, it redissolves again when it heats up spinning in the centrifuge and then reappears during DNA precipitation. I just centrifuge faster it for 1 min instead of 10 and I seem to get clean supernatant and no protein precipitation later. For salts, I’ve found that one of the sodium phosphates in my phosphate solution will fall out of solution sometimes. One day it’s fine, and the next day there’s a bunch of solids at the bottom of the stock solution. It precipitates with DNA, especially in the cold, can’t be redissolved, and seems to bind the DNA. It’s the only crusty white stuff I’ve encountered in DNA extractions and my solution is to make new stocks and phosphate solution more often. I would like to ask you about dna rna precipitation: why dna stays at organic phase at acid ph and rna at aqueous phase? i am isolating RNA from a plant sample. i use isoprapanol for precipitation, But everytime i got a lot of contamination of polyphenols with RNA. Can u help me to get pure RNA?? Sir you explain all things right no doubt,but i have a query that why we use only Chilled(Ethanol or Isopropanol)i.e whats the need for chilling? I am very thankful to you if you help me out in this. Ohh i get the ans as Jason asked the same question to You. Thanx alot sir,I am very thankful to you. Nothing to add, but great info! For some special purpose, I run my DNA sample on a regular agarose gel, then cut the bands. I use 4.7M (final conc) NaI and 42C incubation to melt the agarose gel block with DNA. At this step, can (and how) I use ethanol to precipitate the DNA? Since there are already plenty salts (NaI at 4.7 M), do I still need to add NaOac as usual? If I put this DNA-gel-ethanol in low temperature, can the gel re-solidify and then precipitate with DNA? Your note is very clear and interesing. I think Very impotrant is pH of Sodium acetate ! For prepare 1 litre of 70 graduate ethanol you have to mix 665g of EtOH 96% and 335g of H2O. 1. How to prepare 70% ethanol for DNA or RNA purification? 2. How is it important that 100% and 70% ethanol must be cold during DNA or RNA purification? Nice to read your description. Easy to know the concept. What would happen if you added sodium acetate to a final concentration greater than 0.3 M? Would that affect my RNA even though I perform a wash. I am doing a phenol chloform extraction followed by ethanol precipiation. I decided to increase my reaction volume by adding salt so i would not have to do this later in my ethanol precipiation. That way I increased the volume in which to do my phenol extraction. I then added 100% ethanol and pelleted my RNA. 1) If total quatity of aqueous solution i had is 800Âµl. How much of salt and ethanol(95%) i need to add in? 2) If i had added 1 volume of salt accidentally and just added 1volume of alcohol? what will happened? 3)Any countermeasurement for that situation? I have a question. I am trying to precipitate DNA using the commonly used ETOH method. Initially I added 0.1 vol of NaOAc (3M pH 5.2)and 2.5 volume EtOH (100%)and I left it for the weekend in the -20. However, I can see that the salt has precipitated to the bottom forming a lot of white precipitates! (obviously it is not DNA) and I am worry that I have lost my DNA sample as it is really precious from a colon biopsy. Could you tell me if there is anything I can do. Thanks, this info is awesome. Ok, Just a basic question…at school in my lab we were required to keep the ethanol at a low temperature before using it and my SI said it was due to evaporation although she seemed like she was just taking a crack at it rather than actually giving me a legit answer. 1. Why is the ethanol kept at a low temperature rather than at room temperature? 2. Would freezing the sample (a calf thymus, not a plant)affect the ability to extract the DNA from the cells? The ethanol is kept at a low temperature to reduce the solubility of the DNA so that it precipitates out more effectively. Freezing the thymus sample might actually make it easier to remove the DNA by breaking up the tissue a bit so that homogenization is easier. Should it not be PO4 3- everywhere you have written PO3-? I added 3M sodium hydroxide 5.5ul and 7.5M ammonium acetate 1/3 Volume. After that, I added 2.5 Volume of EtOH. But if add 7.5M ammonium acetate 50ul, is it ok to precipitate this DNA??? Please, answer to me. After doing ethanol precipition, I put my DNA in the -20 freezer so that I can run PCR the next day. Am I supposed to centrifuge my DNA sample again before I run the PCR? if so, for how long? After looking for quite some time I finally located two good articles about ethanol precipitation, one of them is the one Jim H. was talking about, they are available in archive on invitrogen website. Hmmm, it seems I can’t post the links here I added them to wikipedia article on Ethanol Precipitation so just google it and look at the bottom of the page on wiki. I also added links to them to wikipedia article on ethanol precipitation. Zeugin JA, Hartley JL (1985). “Ethanol Precipitation of DNA”. Focus 7 (4): 1â€“2. Crouse J, Amorese D (1987). “Ethanol Precipitation: Ammonium Acetate as an Alternative to Sodium Acetate”. Focus 9 (2): 3â€“5. Streaking maybe due to too vigorous pipetting or vortexing, especially if DNA is long. It can also be due to overdrying of DNA after precipitation. I’m having a similar probelm cleaning my plasmid digests. After digestion, I phenol:chloroform extract the DNA and then extract once more with chloroform to ensure removal of trace phenol. At this point, the digest looks the same as before. THE PROBLEM is after I ethanol precipitate, there is a ton of streaking and the larger bands are sometimes wholly absent. Am I seeing DNAse contamination? You don’t give enough information about the DNA you’re cutting, but I wouldn’t suspect your EtOH or water. One possibility, especially if you’re doing a restriction digest of a plasmid, is that you’re seeing both the linear and supercoiled form of the plasmid. Typically, “contamination” with non-specific nuclease will just give you a smear and not a distinct band on a gel. i am exprience an unussual problem. ETOH precipitation after restriction with VSP1 resulted in an additional band that was not seen in a gel before the precipitation. The water used for 70% etoh preparation and the TE used to dissolve the DNA were checked for contamination and were found negative. Any idea someone? Can etoh triger an unspecific resriction? Recently I tried to purify RNA (46 bases) with 20% denaturing PAGE. After finishing the gel running, I dyed the gel with EB and then cut the band of RNA under UV. Then I put the gel slice into elution buffer (0.5 M NH4OAC, 0.1M EDTA, 0.1% SDS) at room temperature over night and final volume is about six ml. After that, I did butonol extraction experiment and a final solution of 0.4 ml was obtained. 1 ml Ethonal was then added. The tube was buried in dry ice for two hours and much white precipitate was observed. I centrifugated the tube 30 min and got a large amount of precipitate and at the same time, the upper supernatant contains two layers. I removed the supernatant and used 70% ethonal (in DPFC water) to rinse the precipitate twice in order to remove the salt components. Then I dried the precipitate left and made a solution of about 0.4 ml with DPFC water. However, the OD measured is about 0.072 (the crude RNA used is 6 OD). It seems that there is no RNA in the final product. What is the problem with my procedure? How to purify RNA with length below 100 bases by native PAGE? @Yara. I should explain it the other way around : the DNA does not dissolve because it is poorly soluble in 70% ethanol but the salt is soluble enough in 70% ethanol to dissolve, so the DNA and salt are separated. @Ritu. The idea is that for most solvents, including ethanol, the solubility (i.e. the amount of solute they can hold) decreases with temperature. So by lowering the temperature, you theoretically lower the amount of DNA that the ethanol can hold in solution. (see http://en.wikipedia.org/wiki/Solubility#Temperature). But according to Jim (see comment near the top of this list), ethanol precipitation works just as well at room temperature as -20/80. @Ange – It might be the kit you are using. I find that the ratios are bad for certain kits and nothing seems to improve it. But if the RNA you have isolated is doing the job without any problem then there is no problem… just because the ratio is bad does not mean that the sample is no good, it is just one indicator of quality. @Fe – I suppose yeast is only an ideal source for RNA extraction if you want to do something with yeast RNA. If you mean why is yeast used for commercial preps of RNA used for (e.g.) blocking the answer is probably that yeast is a relatively cheap source of RNA – economical to grow and relatively easy to break open and isolate the RNA. Thanks for the explanation. But what about ISOLATION OF YEAST RNA? What makes yeast an ideal source for RNA extraction? Thanks! You’re explanation helped me a lot! I have to extract RNA from skeletal muscle but the 260/230 ratios are not consistenly good (260/230 ~ 1.8-2.0 is good? for mine it’s ususlly 0.9-1.3). Is there a way to improve this? Here is a suggestion to increase the recovery yield especially for very low amount: You can add linear acrylamide before adding Ethanol at a concentration of 5 or 10 Âµg/ml. why do v have to incubate at -80 after adding ethanol..generally temp is reduced to decrease the movement of molecules..wht is it doing here?? this is an awessssome site!!!!!!!!!! but why doesn’t the DNA dissolve as well? Thank you for this website. I just have one question: how does the 70% ethanol wash the pellet at the end? @CL: The final conc means the concentration after everything has been added, including the ethanol. 2 volumes of ethanol is added to give a final concentration of 70% ethanol. I believe this is optimal, but I am not 100% sure. @Paula: Less isopropanol is a less polar solvent than ethanol, so you get the same effect as ethanol but with a lower concentration of solvent. @Sarah and anand: The most likely reason for the white precipitate is contamination with protein. You could try cleaning up the solution with no loss of product using something like Stratagene’s Strataclean resin. I am currently trying to run PCR on some samples that underwent EtOH precip. protocol over a year ago. The samples were stored at -70C and when i took them out of the freezer they were very cloudy. After doing PCR and running a gel I received product for my control, but did not receive product for any of the samples that were cloudy. I was considering running the EtOH precip. again, but have limited sample material. Any idea why these sample are cloudy and/or what can be done with them? Why do I need less isopropanol (1V) if compared to ethanol (3V) when precipitating DNA/RNA? Why is it not necessary to add salt when using isopropanol? How can I justify it in chemucal terms? In precipitation procedure,I got white cloudy soln after adding chiled ethanol?Why it happens? Thanks for this very nice website. It’s quite helpful. 1. About the “final conc” of the salt, does it mean the conc in the solution including ethanol (or before adding ethanol)? What would happen if the conc of salt is too high? 2. In some protocols, people use 2V of ethanol for DNA precipitation. What would be the optimal ratio? The order in which the ethanol and salt are added will make no difference so it sounds like you got your DNA, although you’d be best to check on a spec and/or a gel to make sure! I just heard that DNA will not precipitate if the Ethanol/isopropanol is added before the salt. Is this true? By accident I did this last week and I still retrieve much of my DNA. I do leave the tubes overnight in the -20C. So did I retreive my DNA or something else? @Ali: It sounds like the white junk is the cell debris and the reason is a problem with the centrifugation step. 4000rpm is too slow to separate the supernatant from the white debris so with these centrifugation parameters you will always have some of the debris carry over into the supernatant. Centrifuging at 10,000 rpm+ for 15-30 minutes should help. @Dana: Sounds to me like the sodium ions will help with the charge neutralisation of the phosphate backbone and the EDTA will chelate any available Mg2+, preventing nucleases from damaging the DNA after precipitation. I’ve got one question. Why do we sometime also expected to add Sodium EDTA together with Sodium Acetate for precipitation? I have question. I have been isolating BACs in 96 well blocks for a while now and I do not get consistently good results. The results I hope to achieve are to have clear samples of DNA dissolved in water. However, I often get white junk in my well at the end that will not dissolve. The white junk appears after I transfer lysate from the wells (after I have added a cell lysis solution of NaOH and SDS then finally adding potassium acetate and leaving on ice for 20mins) into 300ul of isopropanol to precipitate the DNA. I sometimes let it precipitate at room temp for 20mins or sometimes at -80 for 15 (which is better? )before spinning it at 4000rpm for 30 minutes. The last step is washing with 70% etoh . I dont understand why there is white stuff in my wells that do not dissolve after I dry off the the ethanol and water. can you tell me which step could be affecting these results. Most of the white precipitate is a K+SDS salt which is insoluble. Some is probably cell debris. Centrifugation removes most of the white precipitate but usually not all of it. For larger preps, I filter the supernatant through a syringe plugged with cotton to remove any residual precipitate. The “dynamic range” of ethanol precipitation is in the range of 18-20 nucleotides, depending on their sequence. Over 20 bp and they will precipitate. Free, non-bound nucleotides will not precipitate under standard conditions. What is the ‘dynamic range’ of precipitation in term of fragment length? That is, do small fragments and nucleotides precipitate as well? Any sugestion how increase amount of DNA. Precipitation was done after reaction with BigDye 3.1. Fragment length 80 – 150 bp. Thanks for the explanation – very useful. Why is it that sometimes the DNA just won’t precipitate out at all? I had this problem today. I tried cooling and even adding glycogen – nothing! Just do the wash in punctilious or 95% EtOH or skip the 70% rinse altogether. The salts aren’t soluble in 95% EtOH and will precipitate. I worked with Jim Hartley & Jil Zeugin in the 80’s at BRL (now know as Invitrogen but really not the same). They published a study in 1982,which is still disputed by some cement heads, proving that the amount of time in the centrifuge is the primary determinant of yield and that cooling the Ethanol actually reduces yield and that incubation has no effect on yield. So put your tube right into the ‘fuge after adding your RT EtOH and spin an extra 10 minutes (instead of having it sit on ice) and I promise your yield will increase. i have been trying to find the Zeugin & Hartley reference, but since it was published in our trade journal (FOCUS)I can’t find it on the web. Thanks for the lead on this information. My apologies, I actually found the Focus article not by Google search but through Wikipedia’s ethanol precipitation article. The other Focus article on ammonium acetate and ethanol precipitation is also cited in the Wikipedia article with the direct link. It also references this post. I don’t think so. The salt will only precipitate if there is insufficient water for it to solubilise in. If it is in solution, no amount of centrifugation will pellet it. is it possible to co-precipitate salt into the sample if we spin the sample at higher speed or for longer period? Glad you like the site. The whole procedure is based upon making the DNA insoluble so it precipitates out of solution and can be pelleted. The lower the temperature, the less soluble things are generally, so the low temperature helps to make the DNA insoluble. I;m pretty sure the optimum is 70% ethanol. As I understand it you need some water in there so that salts don’t precipitate with the DNA. There are always losses associated with EtOH precipitation, but I think it is the still-solubilized DNA that was the reason for the losses. I suppose that the longer you centrifuge the more you would get out, up to a point, but I don’t think the reason you are seeing this is the excess ethanol. Very nice site you have. I’m going to subscribe to the RSS. Anyway, I still don’t understand why we need cold ethanol at all. Why not at RT? I am training a whole bunch of new people in my lab now and this little article just hit the spot. Thank you. Is there optimal amount for Ethanol in precipitation? I heard people say more Ethanol you put in the solution, more precipitation you will get. But I always have to centrifuge SEVERAL times at 150000 rpm! Every time I centrifuge, I get more pellet out! I centrifuge 35min after freezing over night, then remove the ethanol to a new tube. After 5min in room temperature I centrifuge 30min again, then even more products can come out! What can be reason! I put 4.5 V Ethanol. Can that be the reason? You should use 3x the volume of your sample for the 100%EtOH step. You will get a huge pellet if you have gel pieces in your sample, which will call for more than a few 70% EtOH washes. Try to filter your sample to get the pieces out. The wash step removes the relatively small amount of salt that pellets with the DNA. This small amount of salt can dissolve in the 70% ethanol/30% water mix – mainly in the water part as the salt is far more soluble in water than in ethanol. How does the ethanol wash the salt away? I’m a little bit freaked out by the timing of this post since I was just thinking about this very topic yesterday… Oh well, perfect timing. Thank you very much. Thanks for this article. I have extracted DNA hundreds of times but wasn’t 100% sure how and why it worked. Thanks for the explanation! Hi Nick..Thanks for the useful stuff..i hav a doubt that y do we go for 70% ethanol for precipitation..why not 75 or80%? Great post – more please!